In many ways, it’s an entirely different sport from swimming in a gym pool. For one thing, it’s open water swimming. So, weather and waves are a factor. Secondly, the temperature isn’t nearly as regulated. For this and many other reasons, you need to be prepared. WEAR A WETSUIT. It’s what they are made for. And it makes such a difference. I got used to wearing one because I scuba dive and surf a lot. So, wearing a wetsuit for cold water swimming seemed second nature to me. However, I know a lot of people who don’t do this. I can’t emphasize enough how helpful it is. When your core is warm, you can stay in the cold water much longer. And you don’t have to worry as much about developing hypothermia. You can also swim more confidently and comfortably knowing you are somewhat protected from the elements. Either wear two caps or wear a neoprene cap. You lose a lot of heat through your head. So, insulate as much as possible. Neoprene is especially good for this purpose. It does a much better job at keeping you warm than the standard latex cap does. You may also want to wear earplugs and neoprene socks. I don’t know about you, but when my ears and feet get cold…GAME OVER. I can’t function. It creates this horrible aching sensation than completely distracts me. When you take some time to warm-up before your swim, it definitely helps reduce the initial shock to the body. You have time to acclimate to the environment and the water may even feel refreshing. In all honesty, you should always warm up before you swim. This is just one more good reason to do so in addition to all the normal reasons. 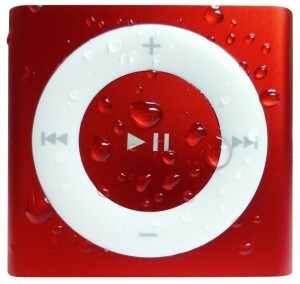 Listening to an Underwater Audio Waterproof iPod Shuffle can help take your mind off the cold. It will keep you pushing your hardest throughout your swim. And the faster you work, the warmer your body will be! I never swim without it. What are your tricks for swimming in cold water? Leave a comment in the section below if you have any advice to add or share.